Specialist, custom lanyard printing that's fast, reliable, and price guaranteed. At Lanyard’s Direct, we produce high quality, bespoke printed lanyards and necklaces that perfectly reflect your brand. In fact we’ve built our professional reputation on being a safe pair of hands in the industry. Our experienced team can guide you through the process to select the right design and style for your needs and budget or you can configure your printed lanyards online in minutes. Either way, we only start production once you have approved a final design, putting you firmly in control of the process. And our price match guarantee ensures that you receive a premium product at an unrivalled price. Need an express service? We offer our many of our most popular styles with express 2 working day delivery and, with 25 years experience in the business, provide a completion date on which you can depend. Our bestselling printed lanyard combine a quality look and feel that's ideal for conferences, events, or corporate use with fast, free UK delivery. A brilliant all-rounder, our classic printed lanyard can be custom printed with your logo, combining up to three different colours as necessary. You have the flexibility to specify the exact Pantone shades you would like us to use so adherence to brand guidelines is guaranteed. For this option we’ve selected the 15mm lanyard, which creates a quality feel and works well with a range of branding styles yet is lightweight for ongoing wear and cost-effective for bulk orders or tighter budgets. As you’d expect from Lanyard’s Direct, this durable 15mm printed lanyard will provide the wearer years of comfortable use. We’ve included a trigger clip and safety break on this lanyard as standard. Our highest quality printed lanyard with a luxurious satin feel that is incredibly comfortable to wear. The smooth finish is the ideal canvas for logos with fine detail, tints, gradients or a broad colour palette, the dye sublimation print process ensuring beautiful, high-definition results every time. We guarantee absolutely no flaking from this durable, long-lasting printed lanyard. We’ve chosen the generous 20mm lanyard, available in a range of colours, which suits a wide range of logo and branding designs and ensures a quality feel. We’ve included a trigger clip and safety break on this lanyard as standard. 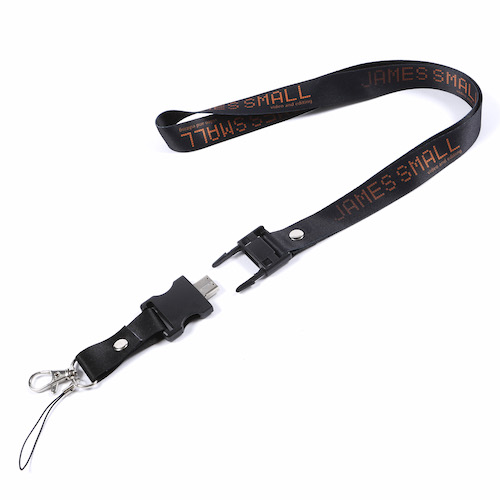 Our double ended printed lanyard is made to the same exacting standards as our deluxe style but with a trigger clip at either end, ideal for holding identification cards. It’s satin smooth to the touch, supremely comfortable to wear for long periods and, in the 20mm style, is perfect for high definition display of your branding. If you are organising a conference, this is the perfect choice. We’ve added a safety break on this lanyard as standard. Plus, if you order this lanyard on our 10 day service you can take advantage of our assembly service. For a small additional fee we can attach all your name cards and wallets before dispatch, printing and laminating them too if needed. While our bestsellers are reordered time and time again, some clients required a style of lanyard that is a one-off and unique to their brand. If that's you, we can help. We offer a full customisation service that includes 3D logo printing, reflective print, a range of cord, recycled, or tubular lanyard styles suitable for printing, as well as a huge selection of clips and attachments, including USB sticks, bottle holders, whistles, phone and camera holders, branded as necessary. Share your ideas with us and we're confident we can create the perfect bespoke product and with the minimum of hassle. Our customers know they can rely on us for a professional service and a quality product that reflects well on their brand, which is why we repeatedly work with so many high profile names. We are proud to include Merck, BBC, T-Mobile, the NHS, IRN-BRU, TimeOut, Morrisons, River Island, Boots, Heathrow Airport, and Primark among our valued clients. Many of our lanyards can be printed and delivered within two days of receiving your artwork. If you require delivery in London, we can even offer a same day service on some products. Plus UK delivery is free! We understand that most orders are time-sensitive so if you need your lanyards fast, don't hesitate to call us on 0208 166 0712 — we're confident we can help. For a small additional fee, we can attach accessories, name badges and badge holders to your lanyards before we dispatch. For conferences and events, we can even print your name badges or cards, laminating if necessary, and insert them into the wallets so you are ready to go as soon as you open the box. We'll follow your instructions to the letter, just call us on 0208 166 0712.